What do you do with someone who is responsible for children being kidnapped, often after having been made to commit atrocities against their own families, up to and including killing them, and for forcing them either to fight on front lines or to serve as sexual slaves? The answer, according to the International Criminal Court today, is lock them up for fourteen years. Such was the fate of Thomas Lubanga, a warlord who has become a symbol of everything that is wrong about the Democratic Republic of Congo, but also a man who's fate seems to offer some hope that people like him may one day have to answer for their deeds. As the English judge calmly read out the sentence today, amid scenes of civilised calm, and as Mr Lubanga stared at the screens in front of him it all seemed a world away from the chaos of eastern DRC. He will no doubt serve his sentence, the 8 years that remains of it after time on remand is taken into account, in similarly calm surroundings before retiring to a villa somewhere pleasant in Europe. OK I made that last bit up, but I wouldn't be surprised. But to me the case asks deeper questions about what on earth you try to do about applying justice to environments in which the most bestial and inhuman acts are commonplace. It seems like a straightforward issue if you talk to human rights advocates - find these people, lock them up and hold them up as an example and a deterrent. And it's tempting to go along with that. But if you're a warlord hearing that, and you know that those women your men raped last night when they ransacked that village on your orders could easily be the witnesses that lead to you being hunted down and imprisoned. Well, you might just go back and finish them off. And make sure future victims meet the same fate too. I sat next to the UK Director of Human Rights Watch David Meopham and gave evidence to the House of Commons Select Committee of the UK Parliament on this subject a few months ago. He was very clear about one such warlord, Bosco Ntaganda, who he said needed to be arrested immediately. He had numerous outstanding arrrest warrants to his name and it was a disgrace he was still marauding around the DRC, he said. Well, they did go after him after DRC President Kabila gave the nod. 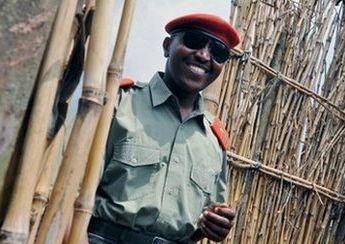 The only problem was that Mr Ntaganda's Militia, named M23, has thus far routed the DRC Armed Forces at every turn, forcing them to flee over the border to Uganda. Yes, that's the official DRC Army, fleeeing to another country for protection. Having seen them up close when I was last in DRC, I am not surprised.They are usually pawns in a bigger regional game which involves the surrounding countries on DRC's eastern borders. Seeing this, the UN forces in that region are now anticipating an assault by Ntaganda on Goma, the provincial capital, which would provoke both a humanitarian crisis with the predictable columns of refugees with nowhere to go and a national crisis that could conceivably lead to a real challenge to the DRC Government as a whole. The last two Governments of that massive country have been toppled by forces marching from the East. So back to the question of justice. 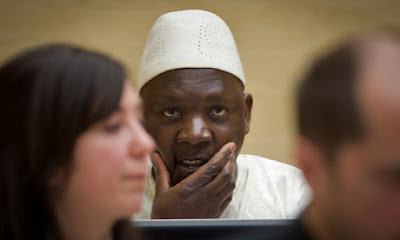 Lubanga will do his 8 years and not really suffer much. Ntaganda will almost certainly not be caught, at least for the foreseeable future. In a situation where Lubanga stands out for being the exception that proves the rule that there really is almost complete impunity in that part of the world, is it really worth the cost in lives to try to apply justice to these people before you have the capacity to actually do it? No easy answer. But it's a question worth asking, even if you feel horrendously guilty in doing so.